Rev. Norbert P. Bibeault, CSV, died at 3:45 a.m. March 6, 2005 at Life Care Center of Paradise Valley in Las Vegas, Nevada. Fr. Bibeault was 74. He was born in Hartford, CT on July 15, 1930, the son of the late Philip and Valarie Bibeault. He was preceded in death by his parents, and is survived by his four sisters: Cecile, Theresa, and Marie Bibeault, and Marguerite Hayes, all of Connecticut, and many nieces and nephews. Fr. Bibeault professed First Vows as a Viatorian on August 15, 1949 and Perpetual Vows on August 15, 1953. Cardinal Samuel Stritch ordained him a priest on August 15, 1956 in Chicago. He attended St. Joseph High School in Berthierville, Canada. He studied at St. Ambrose College (1949-1952) in Davenport, IA, where he received his B.A in Mathematics. He did his graduate studies at the Catholic University of America in Washington, DC (1953-58) where he received a M.S. degree in Physics. His first assignment as a teacher was to Cathedral Boys’ High School in Springfield, IL. From 1957 to 1959, he taught at Spalding Institute in Peoria, IL. 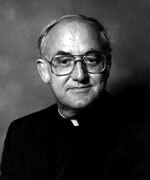 He also taught at Alleman High School in Rock Island, IL (1959-1962), St. Patrick Central High School in Kankakee, IL, (1962-1967), and Bishop Brady High School in Concord, NH (1989-1990). During the 1967-68 school year, Fr. Bibeault was principal of St. Viator High School in Arlington Heights, IL. For 36 years he served as a faculty member at Bishop Gorman High School in Las Vegas, NV. Visitation was held Thursday, March 10, from 2 -5 pm at Guardian Angel Cathedral in Las Vegas. A Mass of Resurrection followed visitation. Burial was Friday, March 11, at Davis Memorial Gardens in Las Vegas. Please remember our brother Fr. Bibeault and his family in your Masses and prayers.